We’re doing something new and cool this week. We’re having our first ever game demo AND our first ever tournament. We’re calling it the Hedge Lord Hullabaloo and you’re not going to want to miss it. It all starts this Saturday at 2pm at Lowe Mill ARTS & Entertainment. We’ll be in the First Floor Connector with a bunch of copies of Hedge Lord that you can play for FREE. If you’ve never played before, now is the time. Dustin and I will be hanging out from 2 pm to 4 pm to show you the ropes. Then, the moment you’ve all been waiting for… the first ever Hedge Lord tournament. If y’all come out, I will personally be so delighted. You can’t even imagine. *Tournament entry is $5, which will go to our hard-working tournament judges, and by entering you affirm that you understand the rules of the Hedge. I was featured in an alumni profile for my alma mater, The University of Alabama in Huntsville. You can read it here. 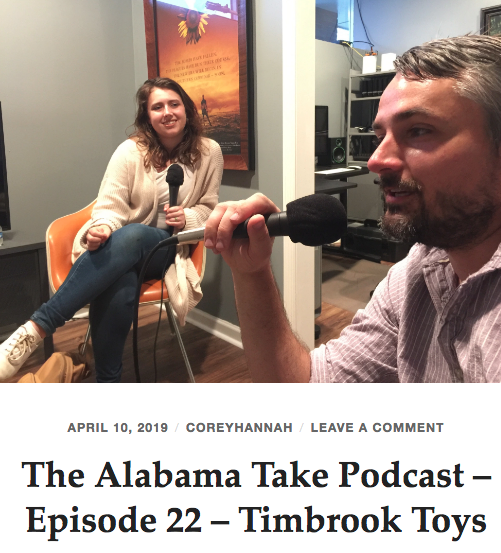 We made our ding dang podcast debut this past week on The Alabama Take! Tune in here or using your favorite app to hear us talk about Hedge Lord, the future of Timbrook Toys, donuts, and Canadian comedy. Thanks for having us, Corey! Did we mention that we got a bandsaw? We’ve needed a bandsaw for awhile to cut out the rotating disks that make up the board and we are so relieved to finally gotten one! Dustin especially.